A suit is generally worn with the intention of making a statement about oneself, create a certain image or simply as an expression of respect. In the corporate world a business suit can convey the individual’s place within the organization’s hierarchy, establish power and position and express one’s proficiency and mastery in his profession. A suit is usually the garment of choice to show respect in special circumstances whether at a wedding, funeral, graduation or other life cycle event. 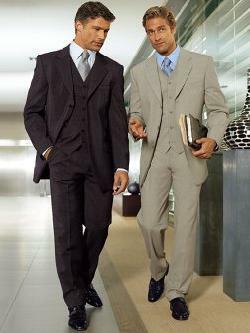 Following are some tips on purchasing a suit. What is super 150’s WOOL? Super 150's Wool = You can probably guess !!! Yet, even softer Than super 100’s and 120’s. Here you are talking about "Celebrity Status." I'm sure by now, you can probably guess how many threads there are per inch ... yep, 150 threads per inch. Here is where you start getting into high-quality. The thread of this story is the numbering system used to describe the new breed of super-lightweight, high-twist wools. Pioneered by Italian mills about ten years ago, these fabrics are made using high-tech machines that spin wool lighter and finer than it's ever been spun before. The various grades of cloth are referred to as Super 100s, Super 120s, Super 150s. The difference between a Super 150's Wool and a Standard Worsted Wool is that the wool in a Super 150's Series is softer, higher quality, and lies just a little nicer on the contours of your body. Your Super 150's Series is named appropriately because it contains 150 threads per square inch. If your budget allows, we highly recommend seeking a Super 150's Series wool or SUPER 120’S. Firstly, consider the purpose of your suit. Are you a business executive that wears a suit several times a week? If so, examine your current suit inventory. Discount those that you seldom wear and establish the colors, designs and styles that you are lacking. Remember that dark suits exude power and authority that are amplified by a pin stripe. These are great suits for presentations, differentiating oneself in the boardroom and demonstrating that you are the authority and leader within the group. Next time you are at a meeting, try wearing a dark blue, black or charcoal suit with a pin stripe, place yourself prominently at the head of the table, stand with authority when you speak and monitor the attitude of your colleagues towards you. Need a business suit that says you are one of the guys? Consider a mid grey suit as first choice followed by taupe and green shades. Beiges are great in the spring and summer months. Consider patterns with soft stripes, checks and various fabric textures. In all circumstances be sure to buy a suit that will fit into to your environment and not single you out as a tasteless dresser. The most important advice that we can give you is do not let your clothing make the lasting impression on your prospective employer. That impression should be transmitted by your skills and attributes. An interview suit should be well tailored, enhance your appearance but not make a statement on its own. A suit that is memorable to the interviewer is usually so because it is inappropriate for one of many reasons; poorly tailored, inappropriate color or design, bad fit, poorly coordinated etc. For entry to mid level positions consider wearing a suit in mid to dark grey or navy shades. For senior management positions wear a dark grey or navy suit – stripes are an excellent choice. Remember the accessories are an important part of the clothing package. Q. Which buttons do I button on my suit jacket? A. Suits are available now in 1 button, 2 button, 3 button, 4 button, 6 button and more! So which do you button? Unless it’s a 1-button suit, never, ever, button the bottom button. This is just for decoration. The bottom button is too low on your hip to button properly without making the jacket buckle and make it difficult to walk. On a 2-button suit button only the top button. On a 3-button suit button the top 2 or the middle 1 (Resist all temptation to button just the top button or risk arrest by the fashion police). On a 4-button suit button the top 3 or the middle 2. 6 or more buttons? 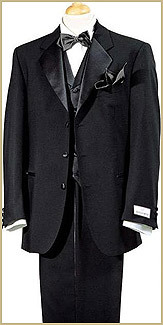 Either leave the coat open or button all but the lower buttons placed where the coat begins to flair out near your hips. - Black or navy suit with a slight sheen or tone on tone. - Never, never wear short sleeves or button down collars. - Tie with small pattern or plain, tastefully coordinated. - Well shined black leather shoes with coordinated black leather belt. - Jewellery that is elegant and not ostentatious. - Double breasted presents itself as the ultimate in authoritative, power look. - White or light coloured pastel shirt. If the suit is plain wear a striped shirt. - French cuff - very appropriate. Never wear short sleeves or button down collars. - Strongly constrasting tie; plain, small pattern or stripe. No picture or large design!!! jacket or blazer and pant. 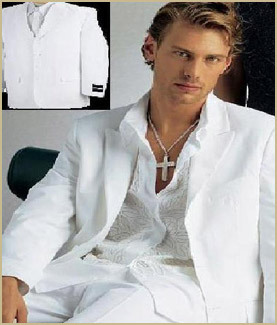 - Medium to light coloured shirt with a suit, dark blazer or sport jacket. Button down collars are fine. - Dark shoes well polished with matching belt. - Tasteful jewellery that is not ostentatious. - Sport jacket or blazer and dress pant or softly structured suit. - Consider wool, microfibre or even silk. Textured fabrics are great. - Patch pockets as a nice casual touch. - Knit top or open collared shirt. T-shirts not a great idea. - Long sleeves are best. - Leather shoes with coordinated belt. Athletic shoes, boat shoes, etc... not acceptable. 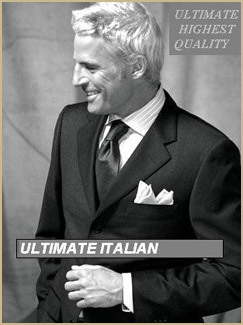 - Semi casual slacks with a pressed crease in wool, microfibre, cotton or cotton blend. - Knit top or open collared shirt. T-shirts not a reat idea. - Leather shoes with coordinated belt.Athletic shoes, boat shoes, etc... not acceptable. Q. Pleats or flat front? A. Pleats are more comfortable, flat fronts are more sleek. Generally we are seeing younger customers begin to try flat fronts, often with a 2 button side vent suit. The majority of men are sticking with pleated front slacks. Forget about 3 and 4 pleat models, stick with 1 or 2 pleats. Q. Cuffs or plain hem? A. Pleats = cuff (generally 1.75”), Flat front = straight hem. Exceptions: Tuxedos Never, Ever cuff a formal pant (fashion police will arrest you and throw out the key!). Pleated pants may be finished with a plain cuff, however, they balance out better and hang better with the extra weight of the pant cuff.